Indeterminate axes prostrate, up to 4 (-10) mm long, attached by unicellular rhizoids with attachment pads; up to two or three rhizoids per segment: branched in regular series of three determinate and one indeterminate branches. Main axes 80-115 µm diameter, 8-9 pericentral cells per segment; determinate branches erect, simple, broadly clavate, incurved towards apex of plant, 250-600 µm tall and comprising 10-14 segments, segments in middle of determinate branches 90-130 µm wide with 10-12 pericentral cells; trichoblasts absent except in procarpic branchlets. 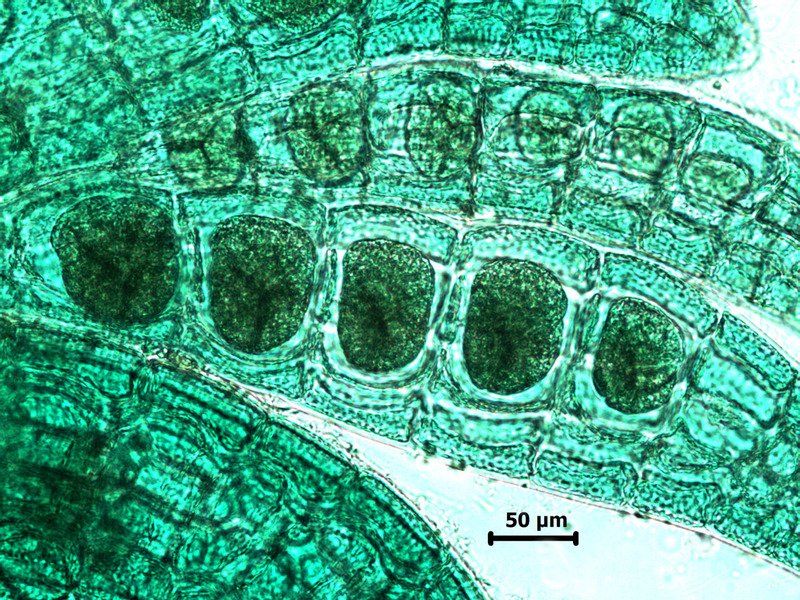 Tetrasporangia 80-100 µm in diameter, in rectilinear series in determinate laterals, borne in segments distal to the elongated suprabasal cell. 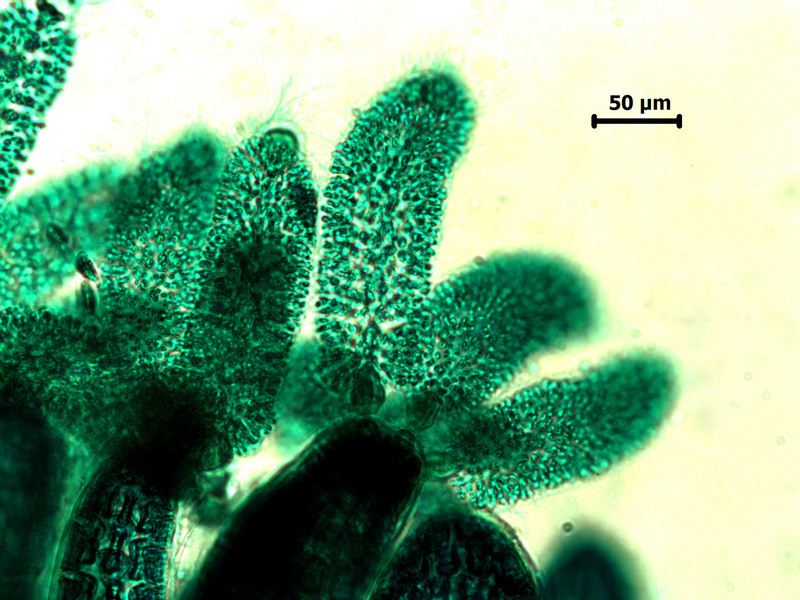 Cystocarps 340-400 µm in diameter, globose to slightly urceolate. Antheridial stands ca. 200 µm long x 50 µm wide, arising abaxially near ends of determinate laterals, cylindrical, slightly curved and clavate. Collected from Arniston to northern KwaZulu-Natal (23-58). Generally epiphytic on larger algae, especially articulated corallines (more especially various Amphiroa species), in the intertidal and shallow subtidal zones. Type locality: Umdloti, KwaZulu-Natal, South Africa (Silva et al. 1996). Note: For further illustrations of reproductive structures in Eastern Cape (Hluleka) material see Bolton and Stegenga (1987). 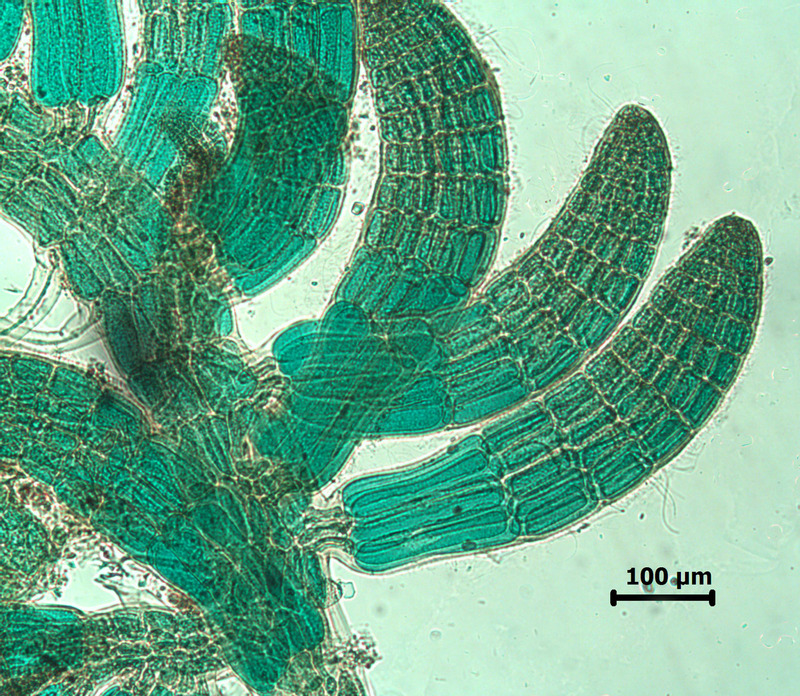 Herposiphonia clavata, apex of thallus showing branching (stained slide). 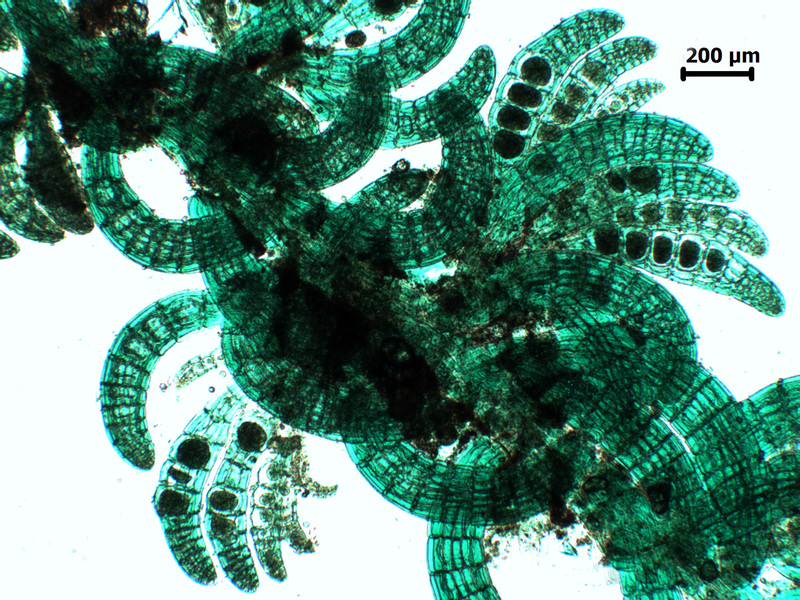 Herposiphonia clavata, note elongated cells in suprabasal segments (stained slide). Herposiphonia clavata, tetrasporangial branches (stained slide). Herposiphonia clavata, tetrasporangia in single row (stained slide). 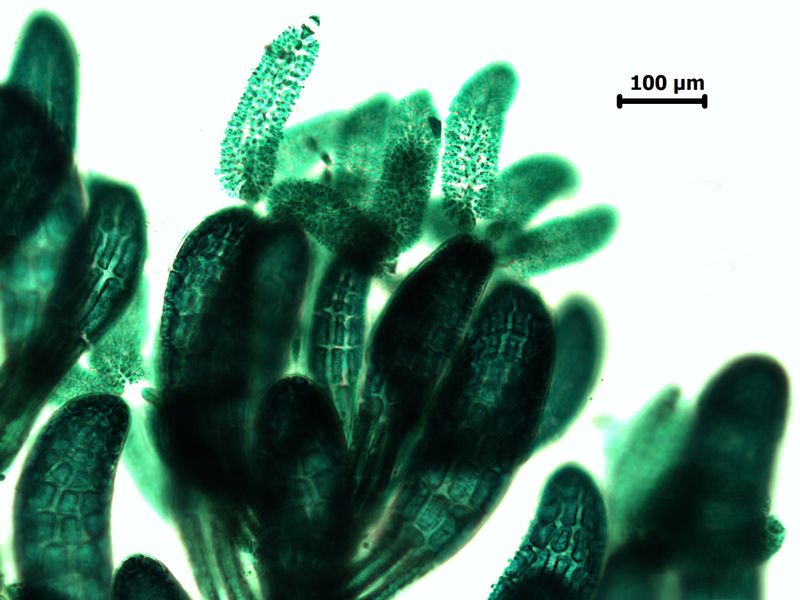 Herposiphonia clavata, antheridial stands (stained slide). 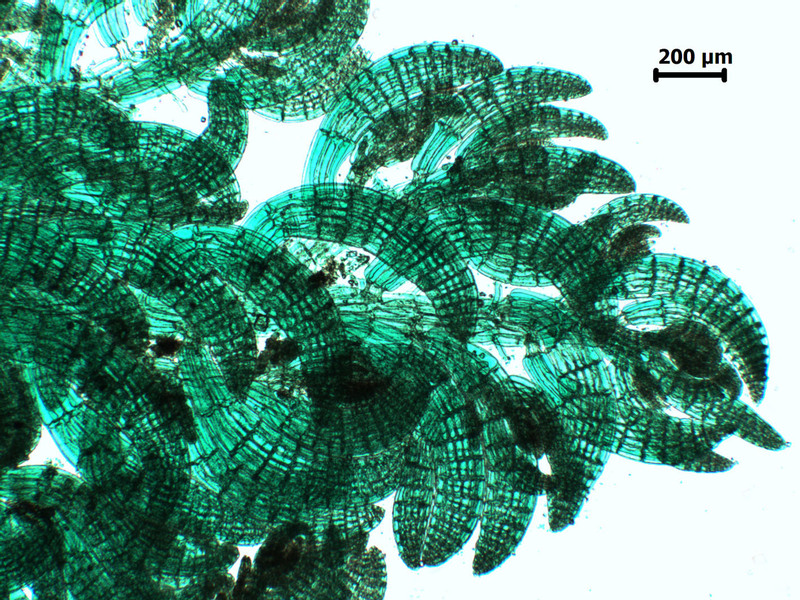 Herposiphonia clavata, detail of antheridial stands (stained slide). Bolton. J. J. & H. Stegenga. 1987. The marine algae of Hluleka (Transkei) and the warm temperate/sub-tropical transition on the east coast of southern Africa. Helgoländer Meeresuntersuchungen 41: 165-183. Guiry, M.D. & Guiry, G.M. 2013. AlgaeBase. World-wide electronic publication, National University of Ireland, Galway. http://www.algaebase.org; searched on 20 May 2013. Wynne, M.J. 1984. Notes on Herposiphonia (Rhodomelaceae, Rhodophyta) in South Africa, with a description of a new species. Cryptogamie, Algologie 5: 167-177, 12 figs.